The latest fear-mongering study about pollution in China has arrived, and it's frightening. According to a new paper in Proceedings of the National Academy of Sciences, bad air in China is blowing across the Pacific and polluting the West Coast. Scary! Well, not really. It's hardly a surprise that dirty air from China could become dirty air in the United States. After all, global wind patterns are kind of a thing. With the Pacific jet streams flowing directly from China to the West Coast, it seems obvious that some of the nasty particles being burped up by manufacturing plants there would end up hovering over Los Angeles and environs. 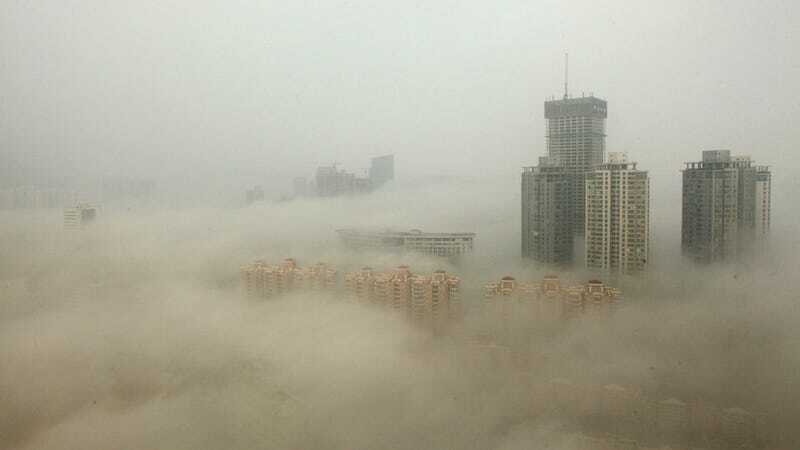 In fact, this is hardly the first time that roving Chinese pollution has made news. Back in 2006, a lengthy and similarly frightening story about "a dangerous brew of soot, toxic chemicals and climate-changing gases from the smokestacks of coal-burning power plants" in China made the front page of The New York Times. Then, two years ago, we learned more about the United States' own role in producing that pollution in a study published by the Journal of Geophysical Research. That's only to name a couple. Here's the thing, though. Americans seem to bask in the schadenfreude of watching China's pollution problems spiral out of control. That's why we're so quick to believe images like this one—supposedly showing a simulated sunrise—that make China seem much more dystopian than it actually is. (Ironically, the sunrise image actually comes from a tourism video.) But when those problems hit our shores, it's really time to panic, huh?